It's the Lounge, a little bit of off-topic is allowed. Not sure why someone respectable like @blackbird71 responded to it though. So you joined just for it? Not a good start for sure. Well, let's go back to our normal programming. You didn't hover on the image, did you? No, I didn't hover on it - I wanted to avoid those fangs as much as possible. The 'microwave links' term I noted earlier referred to the data links used by certain telecoms for relaying some of their traffic, most typically in areas where cables or fiber are too costly to lay (high-rise urban, rural swamps, mountains, etc). You've perhaps seen the large towers with heavy-duty antennae on them. The moment data traffic goes off into the 'ether' by radio/micro-wave, it becomes essentially a directed broadcast - anyone relatively near the path line-of-sight can intercept it, the only challenge then being to break the signal encryption (if any). Moreover, that interception potential exists between every tower along the full relay path, often comprising hundreds of miles - assuming, of course, that the snooper hasn't placed interception gear directly into one of the tower's relay equipment itself. HI all i'm new here i was going to install opera i asked the people at opera they assured me its safe to use, whats your all take on it before i install this program for a secondary browser?? thanks for any feedback you can provide. If you read this topic you may find what you are looking for. Hi leo i did i see you use it and i talked to Opera Dev on the developer blog i feel its safe enough to use and went a head and installed it as my secondary browser, i like the idea of having a proxy vpn to do private searches and such. thanks for the reply back and god bless, and happy new year. Now this is exactly where I "might" draw the line: using the VPN. He concludes: "Concluding, Opera’s VPN service is a HTTPS proxy of which hardly anything is known. It should therefore not be trusted and used if you are really concerned about your privacy." An excerpt: " What Opera praises as VPN is nothing more than a web proxy server. And due to Opera’s business model it should be assumed that traffic and usage data is being collected and sold to advertising partners. In March 2015, Opera bought SurfEasy in order to offer a VPN solution to its customers. However, as several security researchers have shown, this is not the case at all: Instead, the users are simply using a web broxy to browse the internet." Security researchers also note that there is a potential privacy issue: When setting up the proxy, the browser requests a “device_id” which contains a unique user ID. This device_id is sent to the proxy for every browsing request and will remain permantly tied to the browser. This becomes worrisome when you look at Opera’s business model. According to their privacy statement Opera reserves the right to pass on data to third parties for advertising and marketing purposes. Addtionally, SurfEasy logs Usage and Bandwifth data. In summary: Not only is Opera’s “Free VPN” no VPN at all but you also potentially compromise your privacy when using it. As the saying goes: If you are not paying for the product, chances are that YOU are the product. Users who want to be sure that they are browsing anonymously and that all their traffic is being strongly encrypted should better use a paid service like Perfect Privacy which business model does not rely on third party advertising. Well, nothing that haven't been discussed before and nothing that wasn't known. Security researchers also note that there is a potential privacy issue: When setting up the proxy, the browser requests a “deviceid” which contains a unique user ID. This deviceid is sent to the proxy for every browsing request and will remain permantly tied to the browser. True, Leo, but it probably helps to give that information straight up to people who think they are getting total privacy from the Opera VPN that this simply isn't the case. There is no such thing as (total) privacy. hey thanks for the heads up on this i all ready new nothing is completely ever truly private in this world, not even bought and paid for vpn services, if they think you are doing something illegal better believe they will hand it over to the police in your jurisdiction. i simply use it as a service to search stuff that i don't want to use bing or Google to see. other then that its just a secondary browser i'm trying out to see if i like. Indeed! Total privacy exists only in the confines of a person's own mind. The moment a person's expression of something to someone else or their placement of it on paper or in electron patterns occurs, it becomes un-private information to some degree or another. So the issue always breaks down to the basic problem of how private I might wish certain kinds of information to remain,and what form of communicating (if any) that data is most appropriate in my own estimation of the eternal tradeoff between adequate security/privacy and convenience as it applies to me and my particular data. The harsh reality, though not understood clearly by many users, is that if you put information out onto a public network in whatever form or kind, it risks being intercepted and compromised by somebody with enough motivation, knowledge, and resources at their disposal. Electrons will never tell you whether or not they or their patterns of assembly have been compromised along the way to doing whatever a person has intended for them to do. So the question is really: what privacy protections are 'good enough' for whatever the data may be that I'm trying to store or communicate and the risks attendant with its unwanted disclosure? Right! In fact if we talk about data throughput or data payload or flags adjustments in the real world done by a VPN proxy then you can see the VPN as a virus and that depends on your point of view. So, what's the feeling, do you feel more 'secure'? Using a VPN? Not really. I would think that using such would only flag my message(s) that much more. The NSA is going to get it no matter what "if" it decides to do so and taking the trouble to encrypt and send via VPN would target me that much more. I'd have to weigh that over against using public WiFi in which a VPN would be helpful. I would not bother with one at home. @zalex108, if I enter the 100.167.108.62 IP address into the Geo IP Address View website from here in the US, the map location marker shows it located in the center of the United States (Kansas). When I perform a WhoIs lookup of the IP at Network-Tools, it states the lookup failed for 'no data' but states the IP address is from the European Union in region Western Europe. Obviously, something is messed up in the interpretation of the IP location for an unknown reason, and I'd be very cautious about assuming it to actually be in Central China as your map shows. Many mapping sites will default to the national geographic center of a suspected region or country if they cannot identify an exact location or if the address doesn't seem correct. 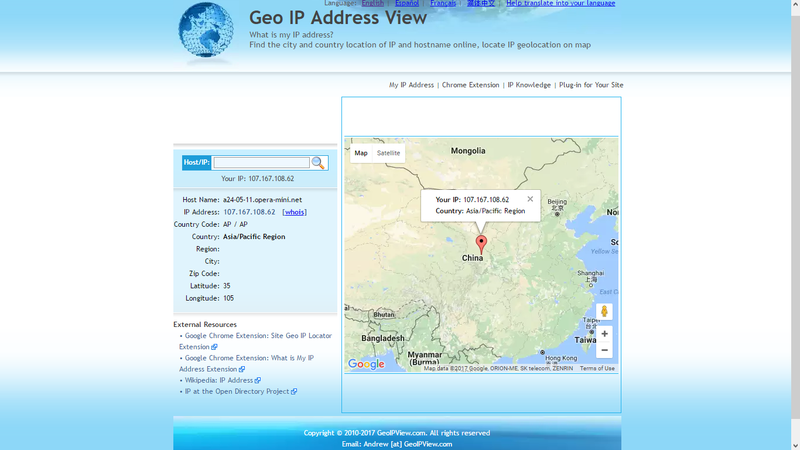 According to https://www.iplocation.net/ the ip address mentioned on your picture seems to be on USA, Germany or Asia-Pacific region depending on the geo-location service. @blackbird71 & @leocg And how is this? I had a look on it and even without Turbo the ISP seems to be in diferent places, at least in same country. In turbo may use diferent servers?¿ But in ISP? Original ISP and users connection place? All IP look-up sites provide responses based on certain of their own assumptions or upon retrieved external data that involves certain assumptions made about the nature and accuracy of that data. Obviously, the mechanisms or algorithms used to pin-point the location of these IPs are being victimized by wrong assumptions. If the assumptions involved are wrong, the location response will be wrong. The observed inconsistency of responses implies that something dynamic or regionally-variable is impacting the analysis process being used to assign an IP location. Beyond that, any further attempt at explanation on my part would be pure speculation. I've always treated the results of IP look-up and location with a heavy measure of doubt as to full accuracy.